6. President Rajapaksa informed the Secretary-General regarding ongoing initiatives relating to rehabilitation and reintegration of ex-combatants. In addition to the ongoing work by the Office of the Commissioner General for Rehabilitation, a National Framework for the Integration of Ex-combatants into Civilian Life is under preparation, with the assistance of the United Nations and other international organizations. 7. Sri Lanka reiterated its strongest commitment to the promotion and protection of human rights, in keeping with international human rights standards and Sri Lanka’s international obligations. The Secretary-General underlined the importance of an accountability process for addressing violations of international humanitarian and human rights law. The Government will take measures to address those grievances. Now, where in these passages is there any indication that the Government is, one, accepting or admitting that violations of humanitarian law were in fact committed, and two, that it was undertaking a “joint commitment” to an accountability process? Mention of “accountability” is tucked away at the very end of the document (paragraph 7), and that only in two sentences. I will turn to those two sentences in a moment, but first let’s look at the paragraphs as a whole, to see if it is possible in some way or another to extract the meanings that the Secretary General seems to think are contained in the document. For instance, since there is mention of UN “assistance” in some of these passages, is it possible to interpret this to cover assistance to an accountability process? Next come paragraphs 5, 6 and 7, where it is not clear that any assistance is being offered or requested. For instance, paragraph 5 deals with LTTE child-soldiers, and the progress the Government had made up to that point in rehabilitating and re-integrating these child-soldiers back into society. The Secretary General says he’s happy with the progress so far, and to carry on. Paragraph 6 deals with initiatives that the Government had taken to rehabilitate adult ex-combatants. There is a reference to “assistance,” but that is to a program to which UN assistance had already been given, and the Government is simply expressing its appreciation. So, it is in this context that one has to approach paragraph 7, which contains the two sentences: “The Secretary General underlined the importance of an accountability process for addressing violations of international humanitarian law and international human rights law. The Government will take measures to address those grievances.” The Secretary General’s contention, to repeat, is that these two sentences establish, one, that the Government is agreeing or admitting that violations of humanitarian law were in fact committed, and two, that there is a joint commitment to an accountability process, which in turn empowers or authorizes the Secretary General to monitor and provide assistance to that process as he sees fit. Is there any indication in those two sentences that the Government is agreeing to any of these things? In my view, there is no such indication. If, for instance, the first sentence said something like, “The Secretary General expressed his concern over violations of international humanitarian law committed during the last phases of the war, and underlined the importance of an accountability process to address those matters,” and the second sentence said something like, “The Government undertakes to take measures to address those concerns,” there may some basis to contend that the Government is admitting that the violations indicated by the Secretary General did in fact occur, and that it will look into them. But as the sentences stand, I cannot see how any reasonable person can interpret that the Government is admitting that violations in fact occurred. In my view, those two sentences as they stand indicate only that the Government is saying it will look into any allegations of violations if such are made, and pursue further those allegations that are found to have merit and substance. There is no question that in the last sentence the Government is making a commitment, i.e., to take measures to address any “grievances” with respect to violations of humanitarian law. But the “grievances” refer to allegations, not to acts the Government has admitted it committed. Now, someone can say, “What good is a commitment (even if it is to investigate allegations) if there is no enforcement mechanism, i.e. monitoring, to make sure the Government actually follows through on its promises?” But even in that case, since the agreement is with the UN organization, and not with the Secretary General personally, it would be the UN in its collective capacity—i.e. the General Assembly or the Security Council—that would be entitled to monitor, and not the Secretary General personally. 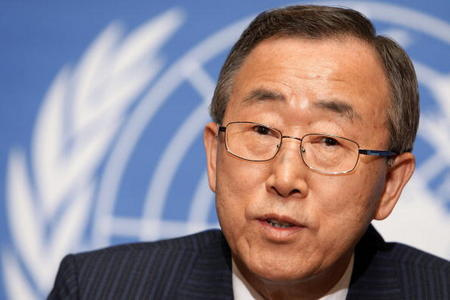 Of course, the Secretary General would be entitled to inform the General Assembly or the Security Council that, in his view, progress with regard to accountability was slow, or some such thing, but it would be up to the General Assembly or the Security Council to decide what to do about it. In sum, then, at least as far as I can see, the purported agreement with the President nowhere contains any of the elements that the Secretary General contends. Even the two sentences which refer to an accountability process, when looked at closely, don’t contain any admission by the Government that violations in fact occurred, or any agreement that the Government is placing itself in a position of being monitored by the Secretary General personally. This means that the Secretary General can’t really use this document as a legal basis for his actions: at any rate, it is a most insubstantial and flimsy pretext for a legal basis. I shall now turn to Article 99 of the UN Charter, because, other than an independent compact or contract such as, say, the joint-statement with the President (which as we have seen is insufficient as a legal basis in this instance) the only other way the Secretary General can try to justify the types of actions he has taken—i.e. commissioning reports and inquiries against a country purely on his initiative—is by recourse to Article 99. As I indicated at the very start, in my view recourse to Article 99 is unavailable to the Secretary in this instance. I want to discuss why this is so, and draw out the necessary implications. Of the two, Article 98 is the more important for my purposes. To repeat, it defines the basic parameters of the Secretary General’s duties: he is to act as the chief administrative officer in the meetings of the General Assembly, the Security Council, and the Trusteeship Council, and also to perform any other functions “entrusted to him by these organs.” So, under normal circumstances, if the Secretary General wants to perform functions other than being the chief administrative officer, they have to be ones entrusted to him by the General Assembly, Security Council or the Trusteeship Council. Article 99, then, provides an extension to this: it allows the Secretary General to bring issues of his choosing to the attention of the Security Council. So, can he justify his reports and inquiries on Sri Lanka by invoking the aforesaid discretion, that is, by saying that he is engaging in these inquiries with an eye to eventually bringing the matters in question before the Security Council? In my view, recourse to Article 99 is unavailable to the Secretary General in this instance, and the reason is obvious from just one glance at the Article itself. The Article certainly gives the Secretary General discretion to bring various issues before the Security Council, but there is a caveat involved: those issues the Secretary General wants to bring before the Security Council have to be ones that in his opinion pose a threat to the “maintenance of international peace and security.” In other words, if he wants to bring “accountability issues” in Sri Lanka before the Security Council, he is going to have to be of the opinion that such issues, in some way or another, pose a threat to the maintenance of international peace and security. Can such an “opinion” possibly be justified? I don’t think so: no one, not even Sri Lanka’s harshest critics, would go so far as to contend that “accountability issues” in Sri Lanka rise to the level of being a threat to international peace and security.